The Tuesday Ride: around, up and over the Palos Verdes hill. For riders in good shape only. The ride starts in two locations, ultimately meeting up at Malaga Cove Plaza for the start of the ride. 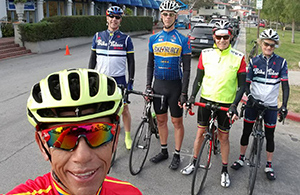 One group meets @ 8:00 AM at the 7-Eleven on the corner of W 25th St and S Moray Ave in San Pedro, heading to Malaga Cove clockwise around the coast. The second group meets @ 8:15 AM at the Northwest corner of Palos Verdes Dr North & PV Dr East, heading to Malaga Cove counterclockwise. Both groups meet up at Malaga Cove Plaza at 9:00 AM, then continue on up the hill past Hawthorne Blvd, then down Hawthorne to PV Dr, and then home.